Before I had a chance to continue with my last subject, another trip came up. Life seems to work that way. We are in the middle of a project and then something else happens. Life just does not happen in the order we have in our minds, yet I believe it has an order of its own. Part of life's lessons is learning to adapt our ideas of order into the order that life gives us. Life continues to be difficult, as I struggle with this lesson of accepting the situation I am in. Lesson one, as I listed in the previous posting was: "Get in touch with me. What do I need? What do I feel? Own it. Feel it." There is a great song I discovered one day listening to Last.fm - Elin Synnøve Bråthen, who sings a song called "Feel It" on her album co-produced with Eliksir, "Earthly Things". This song helps me to do the thing I need to do - to feel what I feel. A lot of what she sings touches me to the core, including the one song I could find on YouTube - You Must Fly. 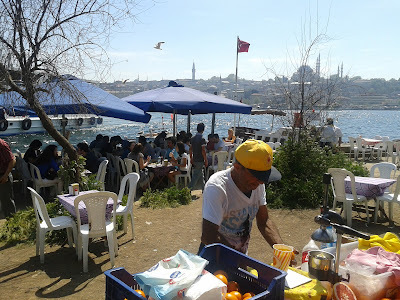 We flew to Istanbul a week after my husband had broken a rib and was in great pain. This trip was planned months ago and we couldn't change our plans. Our son Jon was traveling with us, and we were to meet his girlfriend Dayeong, who lives in Korea, in Istanbul. So we traveled - Jon, who is in love, and whose pain of being separated from his love would soon end, me with my internal pain, and Peter, with his broken rib. Mercifully, much of his pain had subsided in the course of the week, but his pain affected Jon and me. My job was to let his pain be there, and yet try and get in touch with myself and my own needs. This is part of what I need to learn, no matter where it is. This series will attempt to incorporate the lessons I am being confronted with, in the context of being a tourist in Istanbul.